Bozeman has been on my list of places to check out ever since two of my friends in CT told me about their time living there. It sounded like my kind of place, so when Melissa and Sofie suggested going to Montana to learn how to fly fish I was all in! Let me preface this post by saying that we did not learn how to fly fish on this trip. But we did make it to Bozeman and we spent some quality time by rivers and reservoirs. 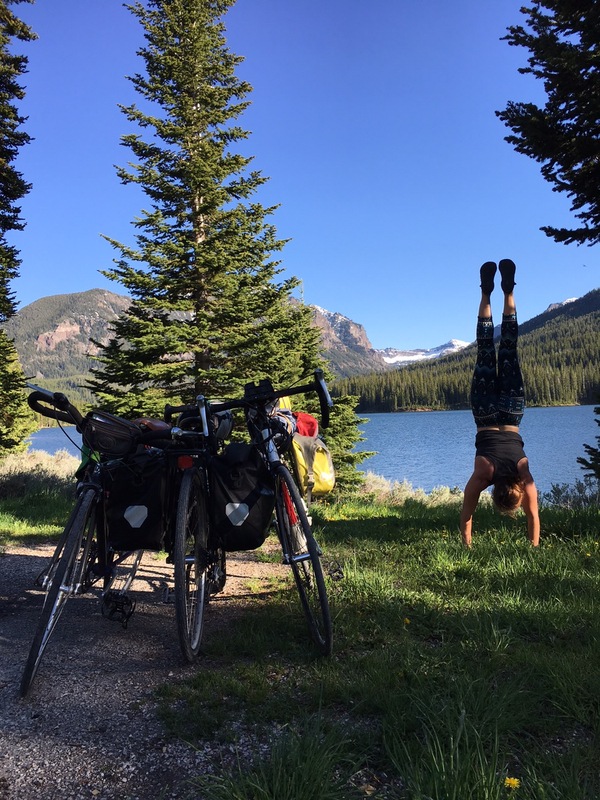 Our Bozeman adventure consisted of taking in the town for a while and then packing up our bikes and riding out of town and up into Hyalite Canyon. On the eve of our arrival in Bozeman we tested out some local brews and met some interesting folks, friends of the fellow adventurer who let us camp in his back yard for the night. Then we got to planning our next overnight. Decisions were made before going to sleep, the plan was to get up early and start our ride. 10 am rolled around the next morning and we rolled into Bagelworks on Main St. to get some much needed breakfast and coffee. We finally packed our bikes for the night and took off at approximately 2:38 pm. This wasn’t the early start we had planned on, but as I mentioned earlier, very little about this trip went as planned and it was perfectly spontaneous. Adventures like these are my favorites because it reminds me to “be like water,” as my wise Uncle Mike would say. Anyway, we rode out of Bozeman’s city limits and started the climb up to Hyalite Reservoir. This was a 10-mile climb surrounded by canyon walls, pine trees, and a roaring river. The view made the climb totally enjoyable. We got to the first campground at the reservoir in an hour and a half. We were beginning to realize how full the campgrounds were when a hero on a motorcycle rode up to us to ask if we were looking for a campsite. He had made a reservation, but needed to cancel it. We followed him to the host, Louise, so we could take his campsite and she let us know how lucky we were. Apparently the sites had been reserved since January 1st. Talk about good timing! This was my first bike packing trip so I wasn’t sure what to expect, but I LOVED it! I borrowed some panniers from a friend and was able to carry all of my camping gear for the night. I strapped our tent to the top of my back rack, along with my sleeping bag. Melissa and Sofie divied up our food and cooking gear because they have slightly larger panniers. ​ ​Here’s the view of the reservoir from the last stretch of pavement! You don’t need a kickstand when you’ve got great touring buddies! I love traveling in low key ways such as by bike or backpack because it seems that people can sense your good intentions. It’s inspiring to encounter the kindness of strangers, like Vance who gave us his campsite, or Louise who wanted to be sure we were safe, or Karley and friends who let us store our food in her car overnight to save us from the bears. Set good intentions and then let ’em ride, my friends! P.S. Thank you for the Beartooth Pass suggestion, we decided to check it out for our last night! Check back soon for road trip challenges and stunning campsites!